Blacktip Shark Recaptured after 164 Days!! 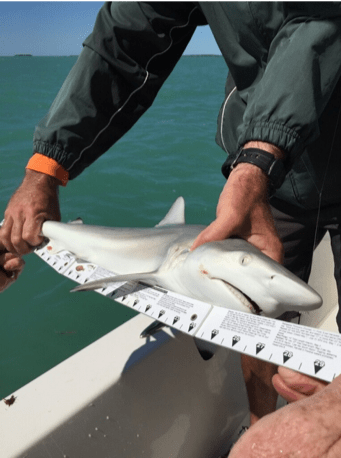 The Blacktip Shark (Carcharhinus limbatus) named “Lucky” (Tag ID: GFR3815) was originally tagged & released by angler Shawn Friedbacher while fishing with Captain Ed McCormick aboard the Shark Ventures charter boat on September 22nd, 2017. The guys were fishing the Northern Gulf of Mexico coastal waters just off Crystal River, Florida, USA. The Blacktip shark was measured to be 27 inches (68.58 cm) total length and had an approximate weight of 10 pounds. While being reeled in, the shark was bitten by another shark and sustained 2 small surface muscle wounds. The small wounds didn’t bleed, so Shawn decided to name it “Lucky” since it swam away in a good healthy condition. Just over 5 months later, 164 days to be exact, on March 3rd, 2018 the Blacktip shark “Lucky” was recaptured by Hugh Gallagher while fishing with Captain John Snouse aboard the Shadow Caster charter boat out of Key West, Florida, USA. 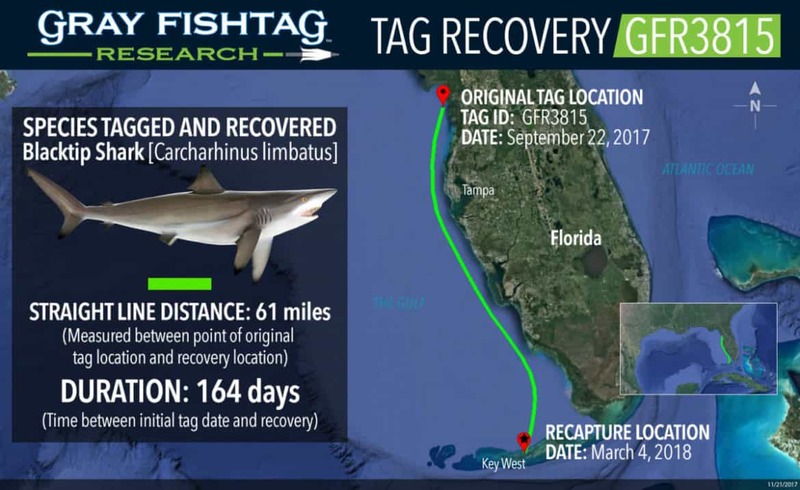 The tag recapture location was approximately 309 miles (497 km) straight line distance from where the shark was originally tagged at in the coastal northeastern Gulf of Mexico waters off Crystal River, Florida. The fish was caught in excellent condition and had a measured length of 27 in (68.58 cm). Species Information: Blacktip sharks (Carcharhinus limbatus) are characterized as a medium sized, stocky shark. They exhibit a dark grey-blue to brown dorsal coloration with a white underside color. This shark species gets its common name from its distinctive black markings on the tips of its fins. Blacktip sharks can grow to a maximum length of around 8.5 feet, but are more commonly found at an adult size of 4.9 feet. Males reach sexual maturity at between 4.4 and 5.9 feet, while females reach maturity between 3.9 to 6.3 feet. Blacktip sharks are found in both inshore and offshore waters but are not considered a truly pelagic species. They are most commonly found in nearshore waters near river mouths, bays, and estuarine areas. However, they do are not venture far into freshwater. In the offshore deeper waters, they are found areas over coral reef drop-offs, but primarily stay within the top 100 feet of the water column. 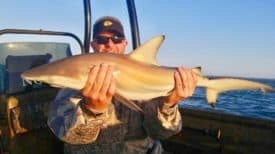 Those shallow inshore waters are home to some of the Blacktip sharks primary prey items such as, herrings, menhaden, mullet, as well as jacks, snook, grunts, and croakers. Blacktip sharks have also been known to consume other small/young sharks and rays, along with squids and crustaceans. Basically, Blacktip sharks are very opportunistic feeders. Interesting Fact: In captivity, Blacktip sharks have demonstrated parthenogenesis, which is when the female produces an offspring without mating with a male. The pup will contain only genetic material from the female and a pup from this type of reproduction will always be female. The Gray FishTag Research program has been able to shatter the expectations for fish recapture rates thanks to the hard-working professional fishermen on the water day in and day out. Recaptures such as this one are truly amazing and entice us to continue our quest of tagging fish and learning more about each species. Our program is constantly growing with new species being tagged in new regions every day. Tags are provided free-of-charge to the collaborating professional fishermen, and the tag data is available to the public at www.GrayFishTagResearch.org Get involved today! The Shark Ventures and Shadow Caster charter boats crew will receive some Gray FishTag gear for their tagging efforts. The tag recovery angler, Hugh Gallagher, will receive a pair of Costa Del Mar sunglasses, a Tag & Recovery Certificate, and Gray FishTag gear for reporting the tag recovery. The tagging and research efforts is made possible by our research centers and sponsors: AFTCO, AA Video, American Fishing Wire, FECOP, Costa Del Mar, CR Primo Fishing Tackle, Seaguar, Shadow Graphics, SouthernMost Apparel, SquidNation, The Fisherman Magazine, AquaWorld, Crocodile Bay Resort, Grande Alaska Lodge, Los Sueños Resort & Marina, Marina Pez Vela, The Pisces Group and The Zancudo Lodge.